My mother swears that the only thing I ate until the age of 12 was broccoli. 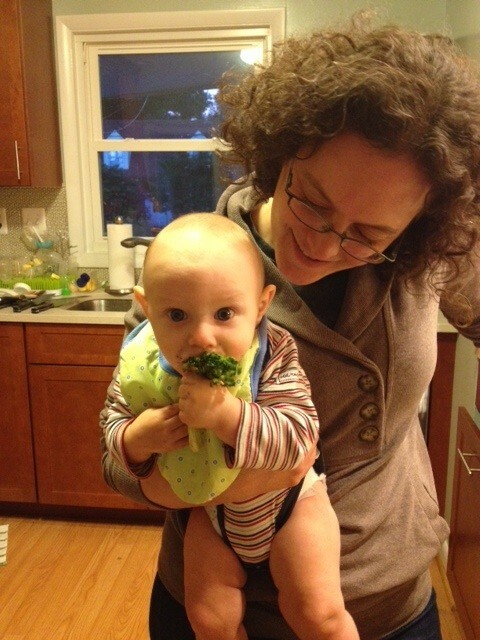 Sylvie agrees, and a family friend once reminisced about my being in a high chair, too young to form full sentences, but making my points using fistfuls of broccoli. Well, Lilli is a bit like her mom in that regards. 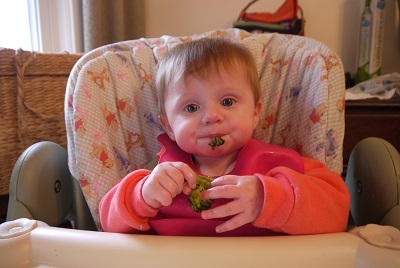 She is a broccoli fiend. 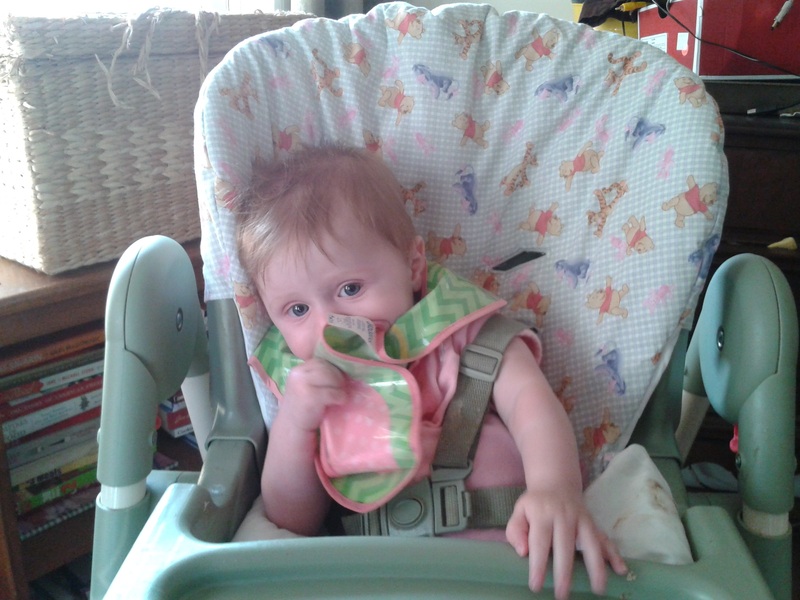 It’s very cute to watch because she eats it upside down: She holds the floret in her fist and starts at the stalk. I keep on trying to explain to her that the stalk is the perfect handle, but she seems very set in her ways for now. Hey, she only learned her name about a month and a half ago. Baby steps. I’ve only served it to her roasted, which, in my humble, broccoli loving opinion, is the yummiest way to eat the vegetable. When you roast it, bits of the shrub brown and caramelize and taste almost candy-like. Sylvie was in Seattle last January, and something called blasted broccoli had become very chic in the city. That, and Macklemore. I kind of can’t believe I just wrote that there’s a hot new broccoli dish around, but I did. I poked around online and gave blasted broccoli a shot. It was good, but unnecessary. All you need is a sprinkling of kosher salt, some olive oil, and a hot, hot oven. I mention my broccoli love well into the third year of writing this blog, because there is a farro and roasted broccoli salad that I make pretty constantly. For me, it’s a bit of a little black dress recipe: Something that’s totally reliable and always tastes good. It’s so the norm in my kitchen that I’ve never bothered to mention it, but, it’s been a weeknight staple in our house for a long time. Roasting broccoli takes about 20 minutes, which is how long it takes to cook the farro in my pressure cooker. 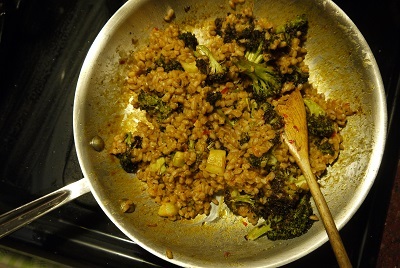 When both are ready, I heat a pan with oil, add some minced garlic, break off about a tablespoon of tomato paste I keep on hand in the freezer, then add the farro and roasted broccoli and cook it all up for about five minutes. I’m not exactly sure where I came up with this method, but a few months back I was reading about the history of Israeli cous cous (extremely fascinating and worth the read) and I noticed that the tomato paste sauté is a popular way to serve the pasta in that country. I don’t remember learning that at any point, but perhaps it’s my Zionist leanings leading the inspiration. Although I’ve read a few places online recently that you don’t have to soak your farro, I consistently do. I can’t risk having uncooked grains when we need to have dinner. I promise you, soaking grains is simple and not a big deal. Right before I go to bed, I pour a cup of farro into a bowl on my counter top, cover it with water, and walk away. That’s pretty much my go-to with all the grains and beans in my pantry. Except for lentils; those I know for certain don’t need any soaking. At some point, I’ll share a killer lentil soup recipe. Good freezer recipe, I might add. Speaking of freezers, farro, like most grains, freezes beautifully. I wouldn’t freeze this salad, but if you have extra farro in your fridge and worry you might not get to it, just pop it in the freezer. It defrosts like a dream. Soak your farro the night before. See note above for more of an explanation why I insist on doing so. When ready to cook, add the farro to your pressure cooker. Cover with water. I tend to add water until it’s a half an inch past the grain.– I always add a bit more water to the cooker than I might need to. I’d rather drain off water than scorch my pot. The farro will cook in 20 minutes once pressurized. While the farro is roasting, clean your broccoli by giving it a good rinse, trimming the green leaves off the stalk, and cutting it into bite-sized pieces. I use my stalks too; just trim off the woody parts and it’ll be fine. Cover a baking sheet with tinfoil. I do this first, a. because my hands are about to get oily because of the broccoli toss and b. so I don’t have to give the pan a good scrubbing in my kitchen clean up. In a large bowl toss the broccoli with the kosher salt and enough olive oil to coat. Dump the broccoli onto the foil-covered baking sheet. Roast in the oven for 20 minutes. While the broccoli roasts and the farro is cooking, mince up two garlic cloves. When both are done cooking, and you’ve drained your farro in a colander in the sink, heat up a skillet with enough olive oil to coat the pan, and add the garlic and tomato paste. Because I always use frozen tomato paste, it really becomes a matter of melting the paste into the garlic and oil. Once the tomato paste has coated the garlic, add the farro and broccoli. The farro will turn an orangey hue. Add a pinch of kosher salt. Heat everything together so that it combines. This should take about five minutes. Serve and enjoy. Last week I decided to add a little chile pepper to the tomato paste step. Good stuff if you have it on hand, but not necessary. As longtime readers of this blog could probably tell, my pressure cooker is my indispensable kitchen tool. There is no way I could write this blog, work 40 hours a week, spend any real time with Lilli and write my weekly Four Questions without it. 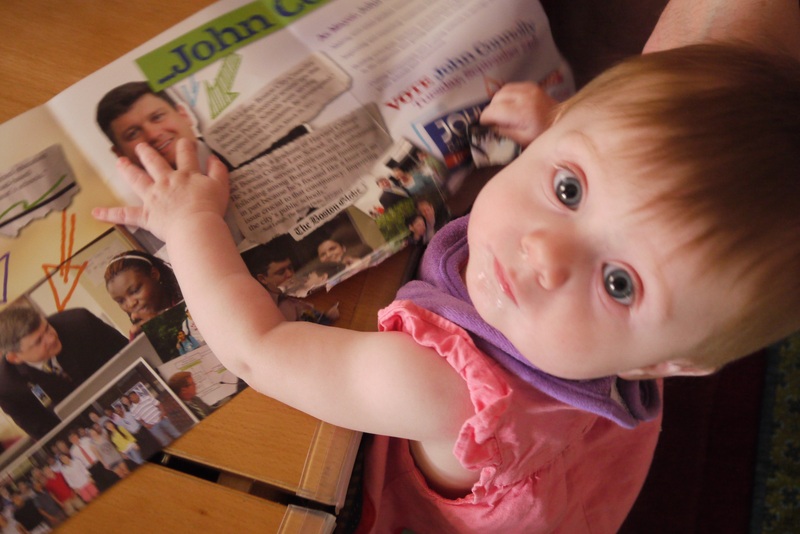 I was a fan before having a baby, and now I’m even more of an evangelist. I felt I had to tone down my pressure cooker propaganda after two idiot brothers filled a pair of them up with ball bearings and explosives and used them to terrorize the finish line of the Boston Marathon this past April. I wasn’t alone; Williams Sonoma stores in Boston pulled the pots from their shelves in the aftermath of the attacks. But it’s been 5 months now. We’ve had concerts and benefits, and things have mostly returned to normal. It’s time to get back on the pressure cooker band wagon. 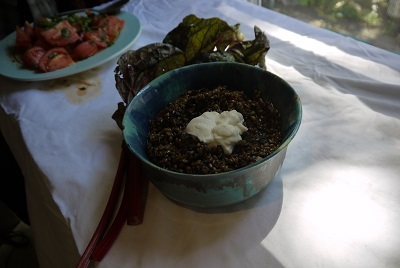 Take this wheat berries, chard and pomegranate molasses recipe from Sami Tamimi and Yotam Ottlenghi’s Jerusalem. In fact, that’s actually what I’m cooking in the photo from that Globe article about said cookbook. What you cannot see, including Lilli’s Exersaucer as she is my kitchen pal, is that I made the recipe in my pressure cooker. As the recipe is written in the cookbook, you need to cook the dish for 60 to 70 minutes. 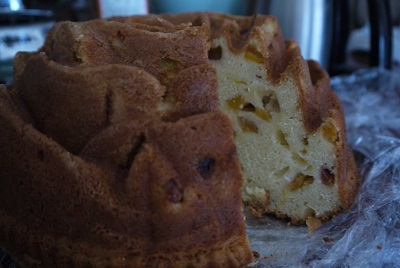 A Sunday afternoon recipe, as I would say. But, if you have a pressure cooker, the recipe will take you 20 minutes. And there you have it: Like magic, a quick weeknight meal. There is one thing I would change within this phenomenal dish: Soak the wheat berries overnight. I’m not sure why the authors don’t instruct you to, but you really need to soak wheat berries. I clean my chard by soaking the leaves (and stems) in a large bowl of cold water on the counter as I assemble the rest of my ingredients. If your chard is very dirty, remove the leaves from the bowl of water, then tip the gritty water into the sink, give the bowl a good rinse, and repeat the cold water soak. You can do this second soak while you prep your leeks. Lilli gets very upset when I release the pressure cooker’s valve, so I have to wait until she’s out of the room to do that step. And, unfortunately, I’ve been having some trouble lately with the sealing ring – turns out they break after constant use over a six-year period. So of course, the pot depressurized too soon when the Globe photographer was here and I ended up sending him home with, um, extremely chewy wheat berries. The dish was still delicious; just too chewy. On Sunday we brought some friends who just had a baby some lasagnas, a Caesar salad and a plum torte. We sat and visited while she nursed and were entertained by her older children. We talked about getting food on the table at a reasonable hour, after school and playdate pick-ups. ”Pressure cooker, pressure cooker, pressure cooker,” I told her. “It will change your life.” Risotto in seven minutes. Soup in six. Dried beans cooked in under 15. You wouldn’t be reading this blog if I didn’t own a pressure cooker. I wouldn’t have the time to write it if I didn’t. But just in case you don’t own a pressure cooker and want to make this dish, I’m including the original instructions as well as my own variation on the recipe. The night before you make this recipe, soak your wheat berries in a bowl of water on the counter. Separate the chard’s stalks from the green leaves using a small, sharp knife. Slice the stalks into 3/8-inch/1cm slices and the leaves into ¾-inch/2 cm slices. Heat the oil and butter in the bottom of your pressure cooker, or, a large heavy-bottomed pan. Add the leeks and cook, stirring, for about 3 to 4 minutes. Add the chard stalks and cook for 3 minutes, then add the leaves and cook for a further 3 minutes. Add the sugar, 3 tablespoons pomegranate molasses, and the wheat berries and mix well. Add the stock, ¾ teaspoon salt, and some black pepper. Close the lid on the pressure cooker. When it pressurizes, cook for 20 minutes, then release the valve. Alternately, bring to a gentle simmer, and cook over low heat, covered, for 60 to 70 minutes. The wheat should be al dente at this point. Remove the lid and, if needed, increase the heat and allow any remaining liquid to evaporate. 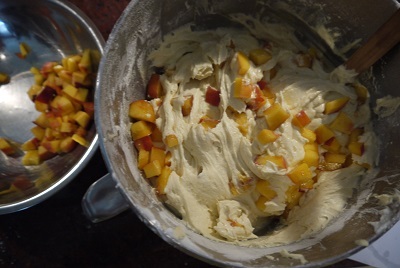 The base of the pan should be dry and have a bit of burnt caramel on it. Remove from the heat. Before serving, taste and add more molasses, salt and pepper if needed; you want it sharp and sweet, so don’t be shy with your molasses. Serve warm, with a dollop of Greek yogurt.